The biomass plant going up at the University of Maine in Farmington will help reduce climate-changing emissions. 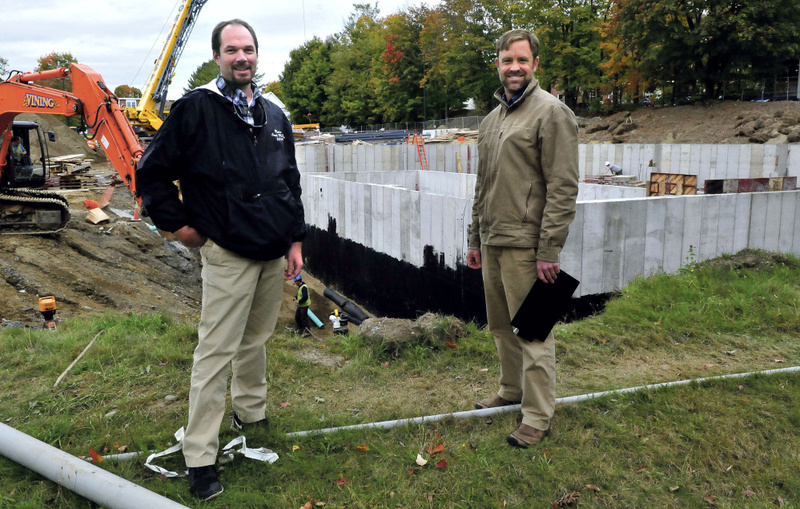 FARMINGTON — Amid dust, dump trucks and construction clatter, a vision of a sustainable future is becoming real on the University of Maine at Farmington campus. On a former parking lot at the back of the campus, the building of a biomass central heating plant puts UMF on track to be the state’s first public college to rely almost entirely on a sustainable energy resource for heat. “This biomass plant offers a very important milestone in our renewable and sustainable energy journey on the UMF campus,” said Luke Kellett, coordinator of the university’s Sustainable Campus Coalition. The $11 million biomass heating project broke ground in June and is halfway to completion. When it’s done, it will replace oil as the university’s primary energy source, and moves UMF toward its goal of being carbon-neutral by 2035. 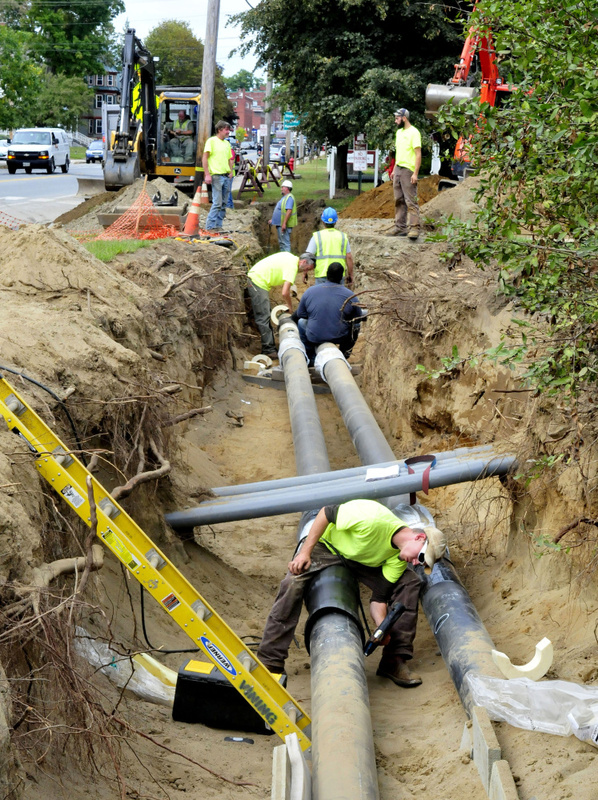 The project was proposed after Summit Natural Gas delayed its plans to extend a pipeline to Farmington until 2016. University officials were not content to put off their commitment to sustainability any longer. “Even from the early stages, (the project) was going to be a natural gas plant with the hope to be biomass at some point later in the future. But because of natural gas backing out, we jumped ahead to go right to biomass,” said Jeff McKay, director of facilities management at UMF. 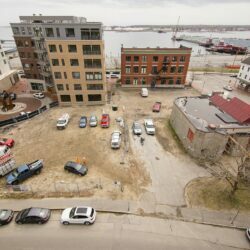 The 5,885-square-foot central heating plant being built on the corner of Perkins and Quebec streets will house the biomass boiler. The boiler will burn 4,000 tons of locally sourced wood chips a year to heat water circulating through 2 miles of underground piping connecting campus buildings to the plant. McKay says the loop is about 80 percent complete and will be heating the campus by mid-November using the existing oil boilers on campus. Over winter break the biomass boilers are expected to be fired up, and by the time the students return, the biomass system will be completely up and running. Aside from the construction of the heating plant itself and the extensive trench work that has been underway to install the 2 miles of steel piping for the heating loop, UMF facilities management workers and contracted Vining Construction crews have to replace large oil furnaces with smaller biomass heat-exchangers in the basements of campus buildings. Similar biomass heating systems are being used by Colby College in Waterville and the University of Maine at Fort Kent. The biomass system in place at Colby since 2012 is larger than the UMF project, but is using steam instead of hot water. It was funded privately by the college. The $2.6 million Fort Kent biomass system was constructed in conjunction with the Fort Kent Community High School campus through a U.S. Department of Agriculture grant and is “about half the size of our heating system, maybe even less than that,” McKay said. The UMF heating plant is projected to recoup construction costs through energy savings in the first 10 years of operation, replacing 390,000 gallons of heating oil now being used annually. Once the new heating plant is in full operation, 95 percent of the campus will be heated by renewable biomass. Four fuel-efficient oil boilers will remain in operation on campus to add heat to the loop and serve as a backup source of heat if the biomass system ever goes off line. The central heating plant is the largest step UMF has taken toward reducing its carbon footprint, but it is not the first. Around 2000, UMF officials began to think critically about the future of campus sustainability and what steps they could take to reduce their carbon emissions in order to combat climate change, Kellett said. In the following years, the school began investing in geothermal energy and has installed 142 thermal wells on campus. It also has converted buildings to meet certifiable LEED standards. In 2010, UMF drafted a Climate Action Plan that lays out the university’s goals for reducing carbon emissions. Kellett said that for many years the UMF campus has emitted around 12,000 metric tons of carbon dioxide annually, though reports show that a slight decline in emissions began in 2007. The Climate Action Plan sets a goal of reaching carbon neutrality by 2035 with an intermediate 2025 goal of a 43 percent reduction in emissions from 2007 levels. Kellett said that UMF emitted about 10,800 metric tons of carbon in 2014, and the campus conversion to biomass will reduce current emission levels by 3,000 to 4,000 metric tons. Projections show that with the biomass heating system in place, the campus’s carbon emissions will hover around 7,000 metric tons, putting UMF on target 10 years ahead of schedule to reach its 2025 goal, Kellett said. “Ultimately we hope to drastically alter the campus energy mix away from fossil fuel to renewable sources. This heating plant guarantees that energy shift and highlights the sustainability commitment that UMF continues to embrace,” Kellett said. The next step UMF hopes to take is to explore how wind and solar power could be incorporated into its energy portfolio. In September, the University of Maine System board of trustees said in a news release that its campuses had achieved a 26 percent reduction in carbon emissions since 2006. As part of its Energy and Sustainability Report, the system also announced that campus dependence on heating oil is expected to drop by an estimated half a million gallons by the start of 2016. “Maine’s universities are leaders on the environment because of our research and our programs, our investments and the daily choices we make across our campuses,” UMS Chancellor James H. Page said in the release. The UMF biomass conversion accounts for 80 percent of the 500,000-gallon reduction occurring on the seven UMaine campuses. Other carbon-reducing projects across the system include a compressed natural gas project replacing 13 boilers at the University of Maine at Machias, three newly installed natural gas boilers at the University of Southern Maine, and the biomass heating system at Fort Kent. In January, the board of trustees voted to begin divesting its direct holdings in coal companies, making UMaine the first public land and sea grant university in the nation to begin divesting fossil fuels. The moves toward sustainability taken over the last year are being fueled by the idea that the university system wants to set an example of environmental stewardship for the students it is educating, said Dan Demeritt, executive director of public affairs for the UMaine system. “We are working hard to be responsible stewards of the tax and tuition dollars entrusted to the university system and of the environment,” said Norman Fournier, chairman of the board of trustees’ Finance, Facilities and Technology Committee, in the release. The UMF biomass plant is already being incorporated into curriculum across disciplines, Kellett said, and with the completion of the project by the end of the year and the inclusion of a classroom in the building, he expects it to become an important learning tool for students. But inclusion in curriculum is only one way UMF is trying to convey a message of sustainability to its students and the surrounding community. As a group, the Sustainable Campus Coalition is made up of UMF faculty, staff, students and interested community members. The group encourages anyone with an interest in the environment or climate change to get involved regardless of their academic background. In essence, the coalition allows any UMF student to get involved with projects like the biomass heating plant and learn firsthand what it takes to enact environmentally healthful projects and policies, said UMF alumnus Paul Santamore, who worked with the coalition when the biomass discussion first began. Santamore graduated from UMF in 2014 with an individualized study degree focusing on poverty policy. In his senior year, he worked as a project assistant for the coalition, leading meetings and helping work on the sustainability plan. While Santamore was not a science student, the coalition allowed him to work closely on issues he was passionate about and to have a say in the direction of UMF’s sustainability future. Kellett says that the coalition encourages student input and hosts energy forums to gauge student attitudes toward sustainability ideas. Santamore recalls that during his time on the coalition, students were concerned about the initial natural gas project for ethical and political reasons, but also because they felt the idea of a natural gas pipeline didn’t fit in with UMF. “The biggest opposition we had with natural gas, other than some ethical worries that the students had, was that UMF was taking the same step as everyone else,” Santamore said. “We weren’t being innovative and we weren’t being different, which is what Farmington is about. It’s a very different place.